Alessandro De Marchi has renewed his contract with Continuum Sports, currently known as BMC Racing Team. The Italian joined the team in 2015, a year in which he also took a stage victory at the Vuelta a España. "Alessandro De Marchi is one of the most versatile riders in our roster so we are delighted to re-sign Alessandro for the coming seasons," said General Manager Jim Ochowicz. "Alessandro takes every opportunity given to him and it's never a surprise to see him in the breakaway of a stage race or Grand Tour, giving it everything he has to go for a stage win. He has had some very close calls in recent years and it's only a matter of time before we see him on the podium again. "Alessandro can time trial well and has been part of seven of our team time trial victories over the years. Some of Alessandro's greatest assets are his determination and motivation, as well as his selflessness when it comes to working for his teammates, so his attitude and experience will be essential for Continuum Sports in the coming years." De Marchi is glad to continue with this project with the addition of a new title sponsor for the next season. 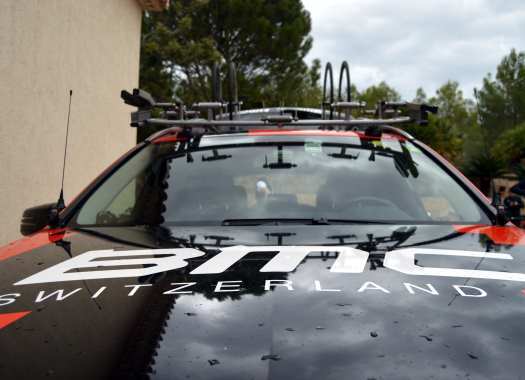 "During the spring, I was starting to look around for other teams and I was quite certain that I would be with another team in 2019 despite all of the things I have enjoyed during my time with BMC Racing Team," the rider commented. "Then, CCC was announced as the new title sponsor and Jim Ochowicz explained to me the new direction of the team. I was really excited by this opportunity and I realized that I could find the change I was looking for whilst remaining with Continuum Sports. So, I am very happy to stay with the team and I appreciate Jim's honest approach and the team's desire to extend my contract. "I think we have an exciting opportunity to retain the team's core structure and welcome some changes, and I think this will help me to find new motivation and new goals. Without having a big leader for the Grand Tours, we will have a different approach to races and this will work in my favour and probably give me more opportunities at stage races. I am also really happy to stay in the same team as Greg Van Avermaet. I have always appreciated and enjoyed the races I have done with Greg, he likes to race in a way in which I can help him, and it's motivating to race with a leader like him."